Just like in real people, psychology drives behaviour in fictional characters. Character development requires an intimate knowledge of one's character's inner workings! In today's how to be an author guest post, Jody Zimmerman outlines his own approach to the psychology of a character. Innumerable things, both real and imaginary, can drive a story. My particular interest as a storyteller is the human condition, and I find myself drawn to authors who have the gift of formulating well developed characters. It is hard to find a better-developed character in literature than Leo Tolstoy’s Anna Karenina — the reason, I believe, so many great writers admire Tolstoy and his ability to delve into the human psyche and deliver it beautifully in sentences. Anna Karenina seemingly had it all: beauty, wealth, and power over men. So what was it in her make-up, her inner-self that ultimately propelled her to throw herself in front of a train? Psychology provides the answer and is also the palette with which Tolstoy develops his characters and drives his story in Anna Karenina. The great psychologist Abraham Maslow set forth the theory that human beings are primarily motivated by fulfilling needs beginning with basic physiological needs like food and shelter and progressing up a hierarchy of higher needs including safety, love, esteem and culminating in self-actualization, where each person reaches his or her full potential as a human being. In a perfect world, Maslow may be correct. 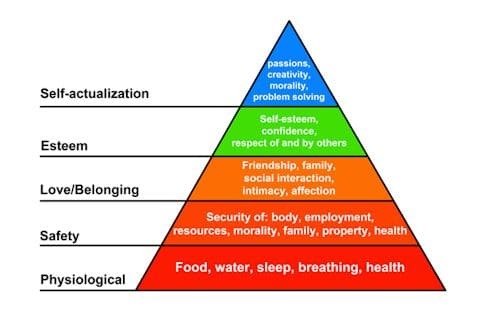 However, my life experiences and years of participating in and observing psychological group therapy sessions, have shown me that most people never make it to the top of Maslow’s Hierarchy—something derails most of us. But, what exactly is it? My study and practice of hatha yoga for thirteen years led me to the compassionate and learned yogi, Lisa Goodwin. She believes that there are only two basic human emotions: love and fear. All other emotions germinate from these two. Lisa’s teachings sparked an epiphany in my body, mind, and spirit, enabling me to drive my own stories through psychological character development, portraying how so often fear and its abundant manifestations smother the love within each of us, driving us along paths we could never imagine, paths not resembling Maslow’s Hierarchy whatsoever. Think of all the inner fears within Anna Karenina that sparked conflagrations of self-doubt, jealously, sadness, and insecurity, so much so that they covered the love deep within her heart, driving her to suicide. My protagonist in Blood Brothers, Philip Hampton, is driven by fears locked deep within him, hidden away so completely that they are unknown to his consciousness. And yet, one glimpse of his brother’s final painting and years of childhood sexual abuse flood his memory and my story progresses. Lisa Goodwin’s theory of love and fear may seem too simplistic on first glance, but it is its elementary nature that is so exquisite and so beautiful. Our universe is one of light and darkness; love is light and fear is darkness. Illuminating the darkness with light is the core of so many religions. It is also the core of understanding the complexities of the human spirit. And even though many great stories end in tragedies, recognizing and understanding the fear responsible for those tragedies and how replacing that fear with love benefits us all as human beings is the mark of great literature. What are your thoughts about character development through psychology? Share your thoughts in the comments below. If you have a blog, click the "commentluv" box to share a link to your own latest blog posts.